Reading challenges aren’t just for summer. 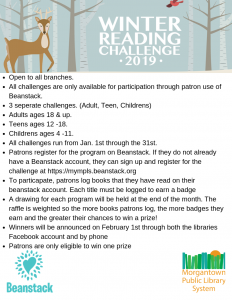 Join in on the fun this January by tracking your books using our Beanstack site (https://mympls.beanstack.org/users/sign_in) or download the app (iOS or Android) to your favorite device. There are no paper logs this year please use Beanstack to log your books and get entered to win some great prizes from Downtown merchants.